Is New Google Nav Service Really Android-Only? Yesterday's introduction of the Google Maps Navigation service was seen by many as the death of standalone GPS. That isn't true and rumors of the death have been greatly exaggerated. Consider the whole issue of smartphones-as-GPS devices. Google's new navigation service is free and seems to provide all the features I'd want in a GPS, provided I have a data connection on the handset. That is a major limitation, as I will explain. The Google solution also requires me to use a smartphone as a primary GPS and it may prove difficult to simultaneously use it as a phone. It is certainly possible, as TomTom is doing with the iPhone, to load enough software to make the handset roughly comparable to a dedicated GPS. That means installing not only the GPS application, but also all the maps the user is going to need. That works, but is expensive. 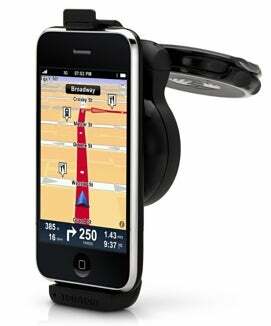 TomTom wants $100 for its iPhone application and another $120 for its car kit, shown here. (Read our review). Note that the built-in iPhone GPS is so lousy that TomTom builds another receiver into its car kit. The company admits that even with that second receiver the iPhone does not receive as well as a standalone GPS, which you can purchase for far less than the combined $220 cost of the TomTom iPhone solution. In addition, you still have the problem of using a single device as a phone and GPS simultaneously. My guess is that, TomTom's car kit notwithstanding, most people will not mount their smartphone-as-GPS up on the dash or windshield, where the phone features might be inconvenient to use. Rather, I expect users will set the GPS/smartphone on the seat or into a shirt pocket. It would surprise me if this form of navigation turns out to be any less distracting to the driver as texting or reading e-mail and certainly requires as much handling of the phone as placing or answering a non-hands-free call might. For many drivers, use of a smartphone GPS while in motion will create safety issues that a properly mounted traditional standalone or in-vehicle GPS system does not. That is why I am still using my Garmin Nuvi when I drive--it is easy to see while I keep my eyes on the road. My Garmin is also my hands-free device in the car. Yes, I have more than one in-the-ear Bluetooth device, but find them uncomfortable to wear. When the phone rings, I do not want to have to find one just to answer the call. The Garmin's speakerphone works fine. When thinking about the Google nav service, the need for a data connection should not be underemphasized. That means there are many places where people need a GPS and the Google service will not be available to them. Did I mention screen size? The standard GPS today has at least a 4.3-inch display and my next one will be 5-inches. The iPhone screen is 3.5-inches and the Droid's display is just a touch larger. Where GPS screens are concerned, bigger is a definite plus. As a search-and-rescue team member, I would much rather know my missing person has a handheld GPS and a pocketful of AA batteries than is relaying on a cell phone for navigation. In the case of an iPhone, power can be a problem if you are keeping the screen lit for long periods so the GPS map is visible. Even if you have the proper topographic maps on your phone, it is not a good choice for navigation in the woods. If all you are doing is some neighborhood Geocaching, a smartphone/GPS may be fine, but if your life may be at stake, please bring a compass and paper map as a backup to whatever electronic tool you have chosen. For serious outdoor recreation, I do not see smartphones replacing handheld GPS devices for reasons too lengthy to fully explore here. In automobiles, I believe larger screens and features that match what Google is offering will keep the GPS market alive. Finally, there are also people like me, who do not mind carrying the right device for the task. A smartphone can be an acceptable or even a good GPS, but in many circumstances it will not be the best choice. Long live the standalone GPS! David Coursey tweets as @techinciter and can be contacted via his Web site. He is certified as a SARTECH II by the National Association for Search and Rescue.